I'm sure all of you out there must have heard of the phrase "Genetic Engineering" or of DNA some point in time in the past few years. Although the technology required for the idea of building a human being from sratch is still a few decades out of our reach, the controversial issues sparked by our ever-growing understanding of these tiny little codes are already showing up all over the place as headline news. For us otaku, do we really care about all those moral issues? Probably not much. But DNA and related scientific issues sure have been a hot pick for manga and anime creators in Japan to use as the backbone in some of the biggest titles in recent years. The most noticable of these starting series that actually employed the concept of DNA manipulation would be the manga and anime series D•N•A² originally created by the hands of Masakazu Katsura in the early 1990's. Like many anime production agencies in Japan, Bandai Visual - Dentsu has been concentrating on producing shorter series in order to allow for more resources to be used in raising the overall quality of their series to be able to keep up with the increasing demand for better quality products. 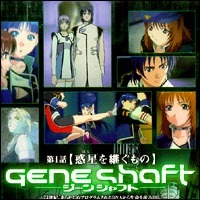 And one of their latest titles - Gene Shaft, released on the Japanese WOWOW network in April of 2001, is without a doubt a winning bet for having the best of the two most important elements needed to be a hit - a strong and interesting storyline and the full financial support of a great anime production company famous for it's high quality works. One of the most interesting parts of Gene Shaft, aside from the show itself, is the world the story was built upon. It is a world we can only imagine, a world with a male to female population ratio of 1:9... sounds like a paradise for guys, huh. Well, hold that thought for a second, there is more to it than just that, folks... a lot more. As the world entered the second half of the 21st century, humanity was faced with one of the most grave dangers in all of it's history... danger of extinction by their own hand. This was a world where widespread war among nations and dramatic changes in the natural environment on Earth had already killed well over half of the human population and threatened the continuing existence of those who remained. In the name of self-preservation, the world began to realize that the only way to allow humans to live without repeating the tragedy was to force the human race to evolve to the next stage, into a new breed of humans with personalities and special skills programmed into their DNA in utero. Through fifty years of hard work, a new government known as 'I.E.O.' was established to rule over a brand new society where the population ratio of men to women had been limited to 1:9. This was done in order to prevent past mistakes from repeating themselves and to keep the population of males to a minimum. The reason for this was that the male gender was believed to have caused the old world's death because of their natural tendency to violence and agressive behavior. Emotions such as passion, desire, and others that may lead to problems were thrown out altogether through DNA manipulation in order to ensure the stablity of the new world. Under these circumstances, humanity managed to avoid their own destruction and finally achieved peace on Earth. With no war or conflict of any kind in the next two hundred years, the new space age arrived. Peace did not only benifit humans living on Earth, but those who were in search of a new world in space, allowing them to stretch their territories all the way out to Mars. Little did they know, the new discovery they found on one of Mars' satellites would lead to a new war - a war for survival. At the same time as the ruin on the Mars satellite was discovered, a golden ring with a 500 kilometer diameter appeared near Earth's high orbit out of thin air, a ring that could not be scanned by any means known to man... In the middle of all this is a new top secret mission involving a newly completed battleship and a giant robot built based on the technology found at the ruins on Mars satellite, First Class Battleship Birkis and the Shaft machine. Newly arriving at the space station Marakanan as one of the new pilot candidates for the Shaft machine is the heroin Mika Seido, a sixteen year old, simple-minded young lady who posesses a wide range of emotions (something extremely rare in the new world). Mika's long-time friend Sofia Galgalim is also assigned to the new battleship as a pilot candidate for the secret mission. As the duo walk through the main incoming flights waiting room, security measures are suddenly tightened. To Mika's suprise, a man she knew through one of her old friends walks through the doorway, escorted by a team of secret service agents . "It... it's him!" Mika shouts angrily and begins dashing for the young man, Hiroto Amagiwa, who shows no trace of emotion on his face even after Mika's outburst of hatred, "I will have my revenge in the name of my friend! ", she cries. But as expected by everybody, Mika's semi-idiotic dash toward the young man who had been walking through the hall under tight security escorts and behind electrical security poles got her nothing more than an intense electric shock. Surprises never seem to have any trouble finding their way to Mika Seido. Just as Sofia tries to comfort Mika after the earlier incident at the bar inside the space station, another man entered the bar with a little girl (men are rare sights, remember? ), Backup Captain Mario Musicanova and his self-proclaimed sister Tiki Musicanova. Unlike Hiroto whom they met earlier, the brother-sister pair seem to be much more talkative and easy to approach. Two of the small things that really interested me, aside from the major points I mentioned above, were the barbed wires in front of the DNA strands shown in the opening sequence . The apparent implication is this: though on the surface our heroes may seem emotionless and quite different from us, we all must have something in common on a deeper level... forced in, as General Director Kazuki Akane mentioned. It's also interesting to see what advanced genetic engineering can do, especially when you see a dog (Mika's dog Bismarck, left to live alone on Earth in the beginning) in a realtime online conference with a human. 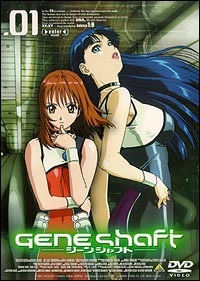 As all of the great anime titles that came before it, the anime artworks and computer generated graphics in Gene Shaft are exceptional, surpassing any computer aided series I've seen thus far. It impressed me how well everything fit together. It reminds me somewhat of the CG work in Titan A.E., but in anime form. Similar to the style used in the Cowboy Bebop series, the opening theme is an original piece by famous guitarist Akira Takasaki entitled "Shaft Drive", and the ending song is by JI-ZO and is entitled "Broken Camera". These are not the typical songs you've probably come to expect from a hero-saving-the-world type of anime series. DNA Program: In order to build a stable and prosperous society, humans were engineered for specific skills, giving them the ability to take certain job positions in the society even before birth. Mika's mother is one of the most well known scientists in this field, and their dog Bismarck (who can type, read, think and understand words) was the product from one of her experiments. S Mission: Little is known about this project, it's the mission which Mika and other crew members from the series were assigned to at the beginning of the series. Only their first destination is known - the Moon. Elder Statesmen: The most powerful advisory agency. Consists of five members (all male scientists) who were all survivors of the old civilization from the 21st century. Because of their age, all members need to depend on life support machinaries to survive. Have been controlling the government from the shadows for the past 200 years. IMMORTAL: A team of elite forces that sits directly under the control of the Department of Human Guidence. But in reality they are nothing more than a private army branch of the Elder Statesmen. Gene Type: Also known as "GT", the very basis of the new civilization on Earth. All aspects of a person were figured out by DNA profiling and manipulation before birth to ensure that they will be fit to take the positions waiting for them after their birth. A special "Gene Type Test Solution" is used to test the category of each person's DNA, changing into color once the solution is mixed with the DNA sample and applied onto the GT test paper. Immediatly after birth, all GTs are in the category "White". But as each person grow, the color of their GT will change, from "White" (which means staying the same, this type of adult GT is extremely rare and little is known about this GT) to the seven rainbow colors. Station Marakanan: A space station orbiting 45,000km above the Earth at 7,000km per second. The designated location for all "S Mission" members to meet. Mika was touring the station on Level B clearance when she first arrived, when the debugging of the Shaft machine was underway inside the station. Department of Defense: the only branch of actual military power in the government. However, because of the peace created by the new civilization after the destruction in the 21st century, the military has not seen any real battle in the last 200 years. The crew and first class battleship Birkis belongs to the IESA (Integrated Earth Space Army) under the Department of Defense. Life Cycle: In a world built on engineered DNAs, the life span of an average human is expected to be 45 years (considered adult after reaching the age of 15) because of the drop in productivity rate after reaching the said age. Ring: A ring-like object, 500km in diameter, that mysteriously appeared near Earth at the same time when the "Ganymede Ruin" was found on one of Mar's satellites. Looks golden and smooth from the outside, though the actual structure and color are very different when viewed up close. Cannot be scanned by any mean known to humankind. Gene Type: Royal Blue. 17 years old. An IESA First Lieutenant. The Shaft driver candidate who holds the best DNA among all candidates. Her name is well known inside military circles. Gene Type: Golden Orange. 18 years old. A Major in the IESA. Backup Captain of First Class Battleship Birkis. Gene Type: Navy Blue. 16 years old. Hiroto's Register, who works for the Department of Population Control. She never opens her lips unless she has to, shows close to no emotion at all under any circumstances. Built based on the data obtained from the Mar's ruin. 500 meters in length. It's rumored to have similar structural frame as the aliens who built the ruins on Mars. During non combat times, it's carried under the belly of the Birkis and can act as an exterior engine during worm-hole travels. Main weapon is a Micro-Black-Hole cannon built inside the chest.